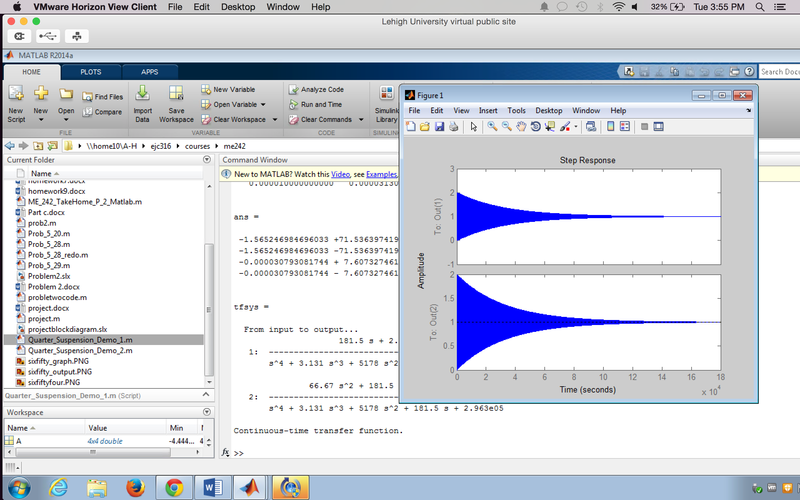 Matlab is a program I had never heard of before college, but I wish I had. The program is actually SO COOL! It’s introduced in a monotonous not so exciting class, and the purpose is to give you some background before getting to harder projects but the exercises given in the class end up being pretty irrelevant. This semester I am taking a System Dynamics (ME 242) with Professor Hart. The final project was to take a system and model it in Matlab and an extension of Matlab, Simulink. I chose one wheel of a car suspension. Granted, I know nothing about cars, and still don’t really know much about cars, but I do know what happens when you take a wheel and drive it over a bump. Pictured above is the step function applied to the system. Without getting into the details of the engineering of the project, I learned a lot; this is my preferred style of learning. Being given a task and working through it slowly to understand what I’m being asked. This style of working and learning is why I personally became an engineer.